ArabSaga: Syria: Will Obama’s key women make a difference? Would the two women named to major national security posts this month by Barack Obama eventually convince the president of America’s “Responsibility to Protect” the Syrian people – by military means if necessary? 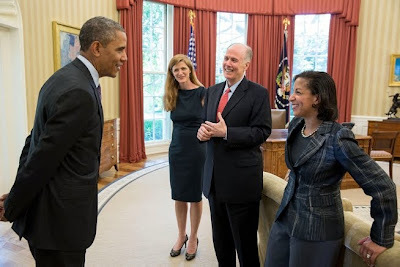 Praising their “integrity and their heart” on June 5, Obama elevated Susan Rice to National Security Advisor and nominated Samantha Power as American ambassador to the United Nations. The two are veterans of his 2008 campaign and have strong personal relationships with the president. But a third woman doubts whether the two prominent advocates of liberal interventionism could prod into action a president who has persistently resisted intervening in Syria’s ongoing human rights disaster. The third woman is Marah Buqai, a Syrian American academic researcher, professor and published poet who was nominated by the Middle East Forum’s Campus Watch project as one of the most thoughtful and balanced scholars among the Middle East Studies faculties in North America. (1) Ms Rice is the voice for humanitarian intervention, which going to war not for imminent national-security needs but to save innocent lives. As the ambassador to the UN, she pushed through the March 17, 2011 Security Council vote of 10-0 to take “all necessary measures” to protect Libyan civilians. Rice was a staffer at the National Security Council in 1994 when the world failed to stop the genocide in Rwanda. A participant in deliberations on the crisis, she later said the White House failed to see the larger moral imperative to act and later told her friend Ms Power, a Harvard scholar at the time and now her likely successor at the UN, "I swore to myself that if I ever faced such a crisis again, I would come down on the side of dramatic action, going down in flames if that was required." (2) For Ms. Power, who has also leaned toward intervention and made her name as a journalist covering the wars in the former Yugoslavia, Bosnia was a formative experience. In her 2002 Pulitzer Prize book “A Problem from Hell,” she presented a history of genocide in the 20th Century and a withering critique of the failure of the United States and other countries to respond to them. (3) Australia’s international policymaker and former politician Gareth J. Evans is the godfather of the Responsibility to Protect concept. “The core idea of the Responsibility to Protect (often abbreviated as 'R2P' or 'RtoP'), as endorsed by the UN General Assembly at the 2005 World Summit, Wikipedia writes on Evans’ profile page, “is that every state has the Responsibility to Protect its population from genocide and other mass atrocity crimes; the international community has a responsibility to assist the state if it is unable to protect its population on its own; and that if the state fails to protect its citizens from mass atrocities and peaceful measures have failed, the international community has the responsibility to intervene with appropriate measures, with coercive military intervention, approved by the UN Security Council, available as a last resort. The concept was expressly designed to supersede the idea of 'humanitarian intervention', which had failed to generate any international consensus about how to respond to the 1990s catastrophes of Rwanda, Bosnia and Kosovo. Ms Buqai writes in her think piece, “In May 2012, I handed Ms Rice at her State Department office a legal memorandum outlining the case for the Responsibility to Protect civilians in Syria. Buqai says the policy legacy of Tom Donilon, the man Ms Rice will be replacing, is the Obama Administration’s shift in priorities from the wars in Afghanistan and Iraq to the fast-growing economies of Asia. The substantial shift in focus from the Middle East and South Asia toward Asia proper could live on after Donilon’s departure. Can the two newcomers make a big difference when Obama’s own presidential priorities do not include getting involved in another Middle East war?